Another goody from a favorite cookbook of mine, How it all Vegan by Sarah Kramer and Tanya Barnard. This was SO easy to make and much more tasty than I expected. If you’ve ever had miso soup when you’ve gone out for sushi…multiply the yumminess by 10 and that’s this soup. It’s got so much healthy goodness in it…and so much taste. The perfect healing soup…when I was pregnant with Bella, my midwife told me that it would be a great after-birth replenishing meal. Miso is a fermented bean/grain paste that orignated in Asia. There are 3 varieties of miso: soybean, barley, and brown rice. I like to use the brown rice miso in this recipe because I find it has the best taste. 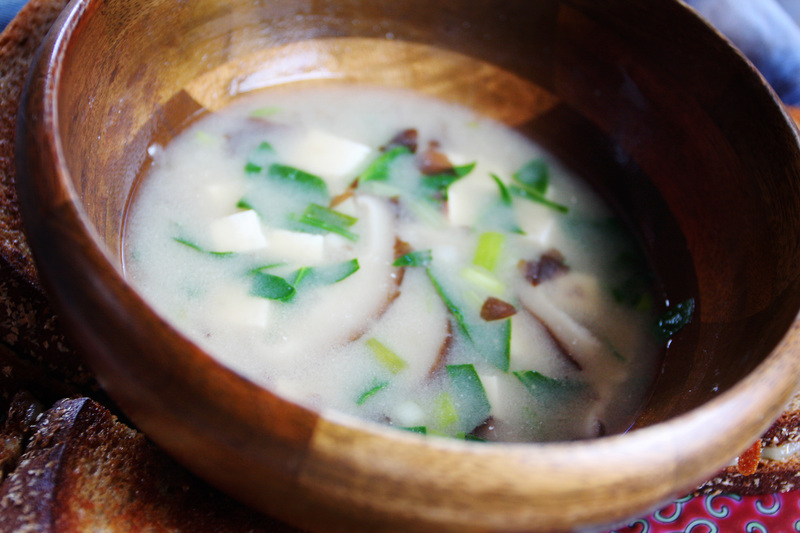 Combining miso with shitake mushrooms creates a balanced protein. Shitakes not only enhance the soup’s flavor but also contain all 8 essential amino acids the body needs. A word of caution, NEVER boil or overcook your miso; this kills all of its nutrients. Always add your miso just before removing the soup from the heat. In a medium pot, add the water, tofu, mushrooms, and dried seawood and bring to a boil on medium-high heat. Reduce heat and simmer for 5-8 minutes, until mushrooms are tender. Remove from heat, stir in the miso, onions, and spinach, and let sit for 30 seconds. Makes 4 servings. I used the sweet white miso and it was delicious! The frozen shitakes worked great. Dissolve your miso in a little warm water first, before adding it to the soup. I didn’t do this, and ended up with giant chunks of miso in the soup. I am glad you posted that little blurb about the different types of miso. I had no idea they made a barley variant. Since I was recently diagnosed with Celiac (gluten intolerance) I have had to watch for things that contain either wheat or barley. I have already had to give up pizza and beer…I would not have wanted to lose miso as well! Your Miso soup looks great. I’ll have to try it for sure! By the way, I’m glad to see you’re posting again. I’ve been checking in on your board looking for a post. Glad to see you’ve posted as you are my favorite blog, even though I haven’t gone raw by any means. I love your earlier posts on vegan and vegetarian recipes. I’d love to see more of your vintage recipes. Glad to see you blogging! I read all of your posts from start to finish over the summer and am excited to see a new one. The miso soup sounds delicious. I will have to make it this weekend. I love that cookbook too but I’ve overlooked this recipe until now. And I just so happen to have some sweet white miso in my fridge! I will have to make this soon. Thanks Sara! Thanks for the recipe! Will you continue to eat mostly raw while pregnant? Can you blog about your pregnancy journey as a vegan? Thanks! Sarah D.
Огромный ассортимент при выборе песка все чаще людей загоняет в тупик. Стало сложнее определять какой класс породы нужен для работы. Одно дело, если вы инженер и у вас есть тех.задание, где написанно: песок повышенной крупности. Посмотрели ГОСТ 8736-93 – все понятно. Но допустим вы простой покупатель и не имеете базового строительного чутья, чтобы на глаз определить вид нужного песка. – На карьере существует строительный, мытый и речной песок. Он подразделяется по отсутствию комков глины. – Как и для чего необходим тот или другой песок, вы сможите спросить по т в Санкт-Петербурге: +7(911)921-16-63. – Стоимость на песок ростет от 155р до 545р/м3. Однако осуществить заказ песок – это начало дела, его необходимо еще привезти на объект. Всего в Ленинградской области существует более 26 забоев, расположенные в разных округах от центра. Ищите площадку для погрузки в минимальной удаленности от вашего квартала. Таким изысканием будет рассчитана карта транспортировки груза. Расчет транспортировки песка на самосвале равна индексу 5р/м3/км. Это и есть автомобильная логистика: “Чем быстрее, тем выгоднее”. Всего: закупка на карьере + мин. удаленность от выгрузки = оптимальная ценность песка. Следовательно если ваш необходимость звучит типа: песок строительный – Мы организуем требуюмую перевозку песка в Санкт-Петербург и Лен. Область по хорошим ставкам и основываясь на ваших предпочтениях.